The fate of the Black Magician and all of Midkemia is revealed in the last volume of the Riftwar Cycle. The Kingdom of Isles teeters on the brink of civil war as the throne lies empty and the most terrifying threat ever to face the Conclave of Shadows emerges in the mountains of the GreyTowers. All races, ally and enemy alike, must unite if Midkemia is to survive. In 1983 a book named simply â€˜Magicianâ€™ appeared on the shelves of bookstores and began the epic Riftwar Cycle that would span three decades and thirty books. 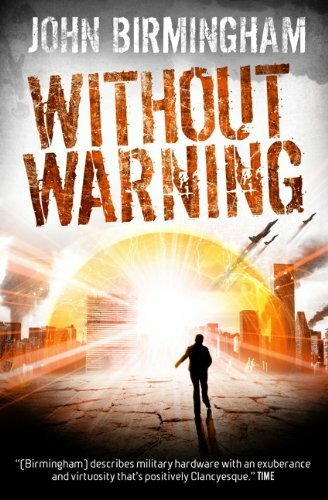 Readers would journey to alien worlds, other dimensions, the depths of Hell and even to the Big Bang itself. 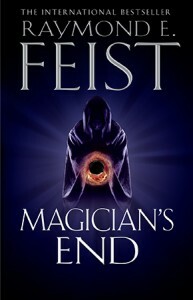 Now, Raymond Feist brings this amazing saga to a conclusion with Magicianâ€™s End. Pug, the eponymous Magician, has long been prophesised to see all that he loves die before he himself can finally rest and this story brings all the events of the previous novels to a head. Feist has set himself an enormous challenge with this final book and the expectations are high. The Riftwar Cycle itself has produced some incredible books over the years from the stunning heights of the original Magician to the outstanding spin-off Empire trilogy (written with Janny Wurts). It hasnâ€™t all been good though and there were low points with some dubious stories crawling out of Midkemia (yes, Demonwar Saga, Iâ€™m looking at you) but Feist has always shown that he can deliver enthralling stories and maintaining the same story world for thirty years is an amazing achievement. Magicianâ€™s End is a large book, bigger than usual for a Riftwar novel at a lofty 650 pages or so. This isnâ€™t surprising really given the number of story lines that Feist has to wrap up here. The story jumps and darts between characters and worlds which risks losing the reader but Feist shows his skill and manages to hold it all together well. All of the characters, both new and old, are given story time and there are even a few cameo appearances from some unexpected characters. Their appearance does seem a little contrived in places but Feist can be given this indulgence as he brings his tale to an end and seeing them again brought a smile to this reviewerâ€™s face. The story does take its time to build up the action and the world-ending threat appearing in the GreyTowers is given little attention in the first half of the book, concentrating as it does on the civil war of the Kingdom. Pug himself is conspicuously absent for a long time and the story initially seems to focus a little too much on the characters of Hal and Ty. 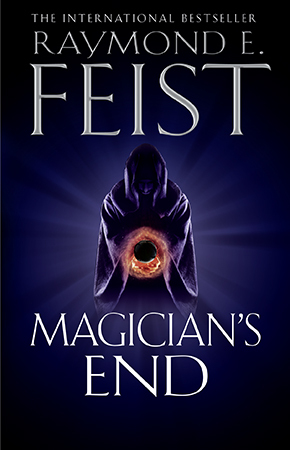 Readers wanting to see Pug and Tomas, his boyhood friend from Magician, appearing on every page may be disappointed, but fear not, there is plenty of time to tell their story and Feist does manage to pull this off on the whole. Itâ€™s quite easy to imagine that Feist could have written a 2,000 page novel here with all that is happening and sometimes the action does feel a little rushed, but the frantic pace actually serves this story well and the feeling of chaos and impending doom seeps out of every page. Feist has always been one for epic fantasy and this novel takes epic to a new level. The very existence of reality itself is under threat in Magicianâ€™s End and the scope of the story is quite dizzying. This could almost have been a saga in itself and Feist packs a lot in so thereâ€™s no room to get bored here. Magicianâ€™s End is an ambitious book and almost succeeds in living up to the high expectations of this final novel. The characters are the centre-point of this story, quite rightly, and even the usually flat character of Magnus is fleshed-out with more of his emotions and backstory revealed. Feist manages to close the annals of Midkemia on a high note and goes out not with a whimper but a giant, ear-shattering blast. I challenge anyone who has been with the saga over the years not to have a lump in the throat or a tear in the eye as they close the cover on this incredible book and incredible saga. Thank you, Ray, for this worthy conclusion and all the wonderful tales over the years, itâ€™s been quite a ride. Oh, and does Pug meet his Magicianâ€™s End? Well, youâ€™ll just have to read the book and find out for yourself, wonâ€™t you?